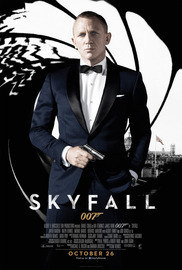 Skyfall (2012) is the twenty-third spy film in the James Bond film series produced by Eon Productions. It features Daniel Craig in his third performance as James Bond, and Javier Bardem as Raoul Silva, the film's villain. It was directed by Sam Mendes and written by Neal Purvis, Robert Wade, and John Logan, and features the theme song "Skyfall", co-written and performed by British singer Adele. It was distributed by Metro-Goldwyn-Mayer (MGM) and Columbia Pictures.